If you follow me on Twitter and Instagram, you would already know today is my birthday, I haven’t been able to shut up about it. I took a few days to reflect on what I’ve done and achieved this past year and I was truly overwhelmed. I’m grateful for the constant support I receive from my friends and strangers alike, you guys are amazing, thank you! P.S: I love food and envelopes that contain money as birthday presents. 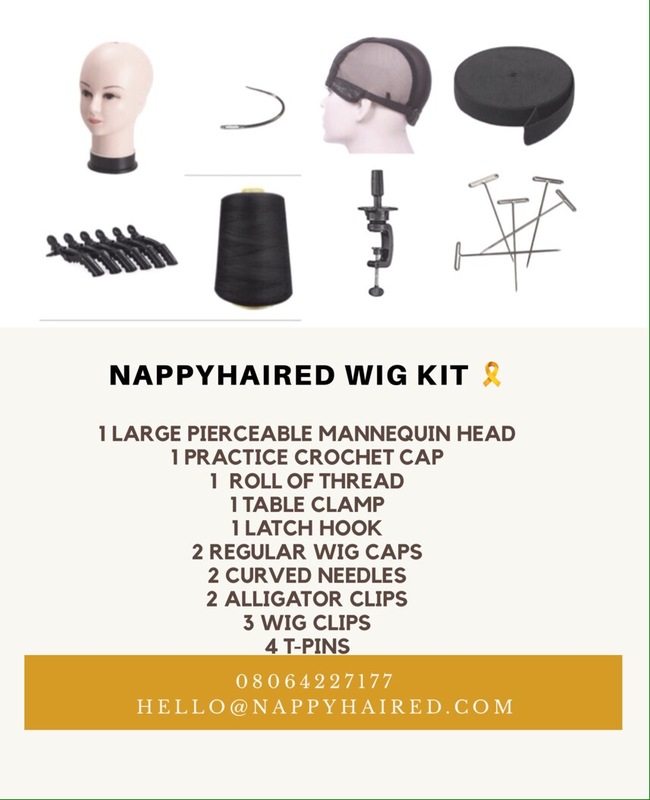 I get questions all the time on where to purchase wig making supplies and tools in Nigeria, trust me it was a huge struggle for me when I first started too. Thankfully, all your many questions pushed me to finally do something I’ve wanted to do for a really long time; curate a beginner-friendly wig making kit. After 3 years of making wigs and teaching others how to make wigs, I’ve been able to put all my knowledge (and love) into curating 20 wig kits and the great part is, as a way to celebrate my birthday, 20% of the proceeds from the wig kit sale goes to The Dorcas Cancer Foundation. The Dorcas Cancer Foundation is a non-profit organisation that was founded to support children suffering from cancer in Nigeria, as well as their families. Our mission is to ensure early detection, accurate diagnosis and prompt & proper treatment of all childhood cancers in Nigeria. What Is In Your Wig Kit? Note: You can order items off the wig kit separately. I love your dance on this post. Happy birthday Alex, more success and joy🎈🎈. Congrats on your wig kit startup!!! Happy birthday Alex!!!!! nice work dear, you just inspire me everyday!!!! Happy birthday Alex. God bless ur new age. Happy birthday dear. I hadn’t an idea! Cheers! Happy birthday dear.. More grace and I inspiration shall be your portion. Congrats on the new addition to your brand /business.